Classic mount and balance of tires. We balance tires with the force of gravity - like the deities intended. Just like they do at a MotoUSA National. 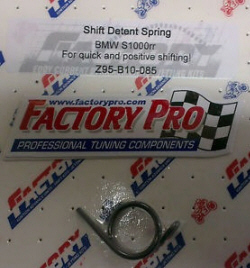 Can you send me one of the wonderful shift springs to Germany? 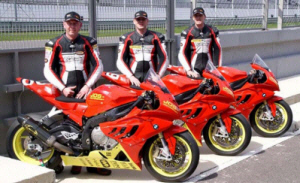 I need one for my hp4! Can you tell me a price for the spring include shipping to Germany, please. From the originators of Shifting tech! 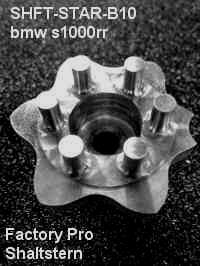 Improve BMW gearbox missed upshift and downshift problems. Makes even the stock quickshifter work better. Use with our B10 shift spring. Improves shift speed by 3ms to 5ms each shift - up and down - and helps eliminate missed up shifts and more consistent down shifts, especially under trackday and race conditions. Helps prevent shift engagement dog and shift fork damage caused by missed shifts. Better shifting - even at race speeds - even with the stock BMW quickshifter. Easy install - just have to remove clutch basket assembly. No case splitting required. Takes 1-2 hours. 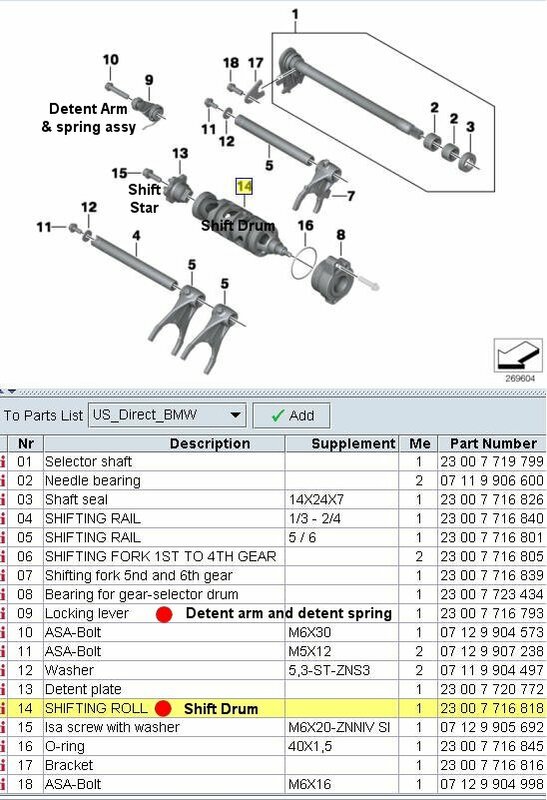 Suggest have a BMW Service manual. 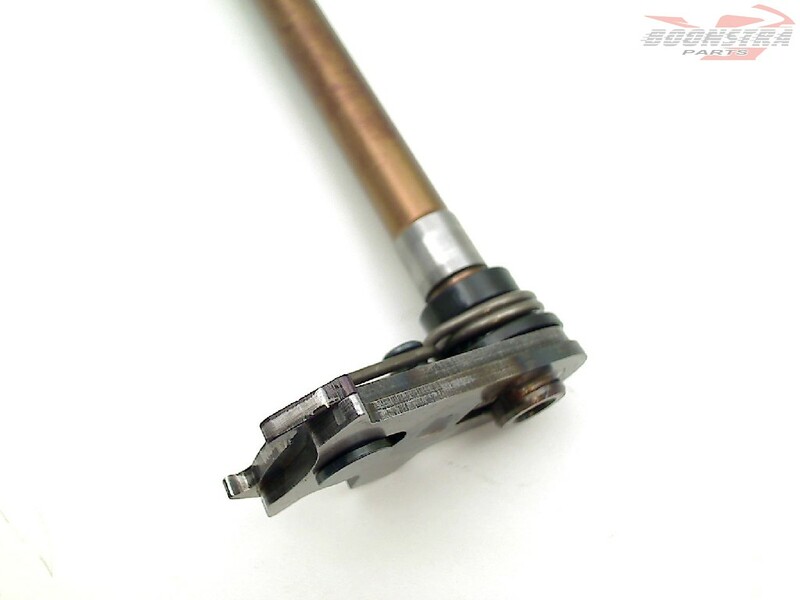 If using a "switch type" quickshifter shift rod sensor (like Dynojet), with programmable "shift kill duration" delay, you should subtract 5ms to start. 35-40-45ms is not unrealistic. "HM" strain gauge type quickshifters - may want to look in to decreasing "sensitivity" a bit as the shift completes quicker with the spring, Changing sensitivity to "less" is similar to decreasing "shift kill duration". 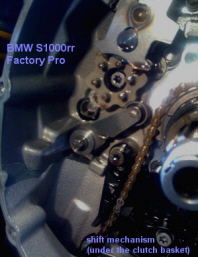 Improve BMW gearbox missed upshift and downshift problems. Makes even the stock quickshifter work better. If using a "switch type" quickshifter shift rod sensor (like Dynojet), with programmable "shift kill duration" delay, you should subtract 5ms to start. The Shift mechanism shift spring made the bike shift quicker. The gearbox shift mechanism was pretty lazy. No more missed shifts (I meant fewer missed shifts, more secure shifting and quicker). According to BMW, too, power is the same 193 at peak with Sport, Race and Slick modes. The four Mode setting allow a rider to select a set of variables according to riding conditions, preferences and skill level. Slick, Race and Sport Modes all make the same power at full throttle. Any minor variations in power are in the Factory Pro industry standard 1/2% repeatability range. 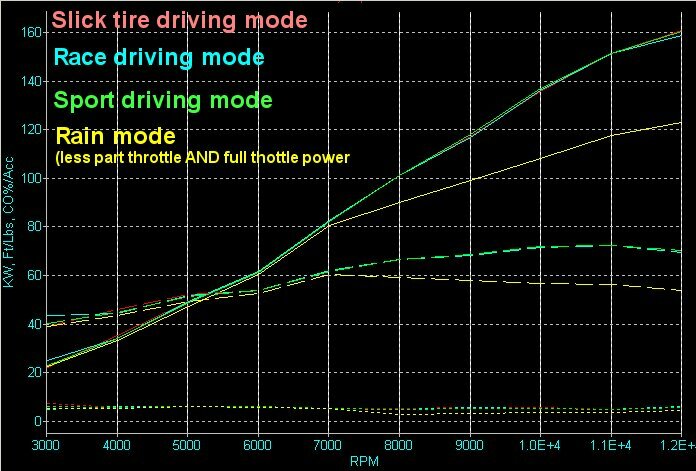 Mostly, we were trying to verify what some other dyno company said - that was that Race Mode made 4-5 more hp than Sport Mode at full throttle. It doesn't when power measured under load - maybe it does in a 6 second 4th gear sweep (as if that's "real world"). Slick, Race and Sport make most "full throttle power". About 160 True hp today. Rain makes almost the same power up till 7000 rpm, then, about 12 hp less at 8000 rpm and around 40 hp less at 12,000 rpm. 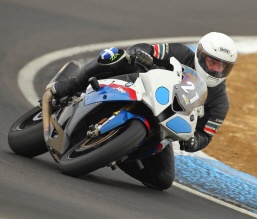 Slick, Race and Sport modes have differing levels of traction control - based on how far the bike is jeaned over (based on solid state gyroscopes). That's the short answer - I think it's a bit more complex than that - as in "can you do a burnout"? If so, in which modes? 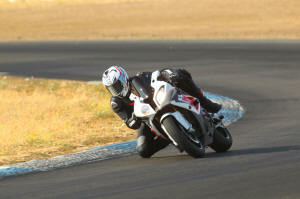 Slick, Race and Sport make, probably, most to least, power at smaller throttle openings. There are other slight differences in fueling in the different modes. When installing clutch, make sure all notches on the backside of the clutch basket are lined up. Telltale: if the clutch lever has more free play than before, the notches aren't lined up. Primary stack 59mm od and 54mm id. Still want to see if Rain, Sport, Race and Slick TC settings make more power. The local dealer said that they were told that a dealership level dyno at Leo Vince said that RACE makes 4-5 more djhp than SPORT Mode (it actually makes the same power at full throttle Sport, Race and Slick).. 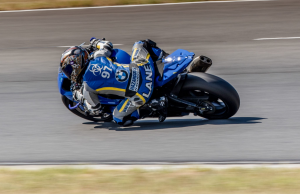 Team called up and said that, according to a SoCal dealership, weird traction control function might be caused by the PC5 being wired in a way that interferes with the CAN communication stream used by the Bosch systems (which is made in Hungary, btw). Drove a few hundred miles to our spring manufacturer yesterday afternoon. Saw a WW2 3400 hp (12,800 dynojet hp :-) B-25 at the airport near there. I have 2 hours of logged flight instruction in a B-25. Take a guess at how much fuel costs... a B-25 burns about 160 gallons per hour at $5 a gallon at low power "cruise". $800 an hour for gas. Got home after 9pm. We hand made about 20 prototype shift springs. Traction control control hexed. Worked 2 nights ago, now it won't change. Yes..... Mode push till desired mode selected. Pull clutch lever in and release. Worked 2 nights ago, but, not today...... Talked to rider.... he says try rolling the bike around sometimes made it switch. Pulled clutch to get at shift mechanism to address shift issues on the track. Nice. Easy. Very japanesey looking. 27mm clutch basket nut. 12 point 6mm socket to remove detent pivot bolt. Looks promising. Drove 200 miles out to Central Valley to make a batch of prototype springs. Shift mech could be better. 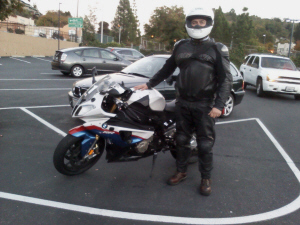 Switching to pump premium and will test Slicks, Race, Sport, Rain Traction Control horsepower output, later. maybe needs more or less ignition timing, using 5 gas ega and steady state dyno as clue. Has poor co2 numbers when making best power. Interestingly, when just looking at residual O2, the dynojet "autolink mapping" looked ok, but according to power produced at "other than right AFR". the engine wanted something different and was smoother and made more power under load with different fuel amounts. Was ~160 with dynojet autolink mapping. no power light PC5 secondary box, disconnected it. Has dynojet injector connectors with no connector locks. PC5 is used to cut fuel to secondaries for quickshifter to kill all 8 injectors. Rider was having trouble shifting as he was assuming that the qs was killing the engine (but it likely wasn't). Told mechanic to call dynojet. turn off traction control or bike shuts off at about 10.7k rpm on EC997 dyno. Can't get rear wheel to slip on EC997 dyno roller on dyno. at 10.7k, bike burps then shuts off engine until key is switched off then back on.